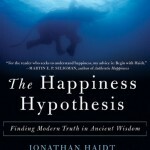 In the last chapter of the book the Happiness Hypothesis, Jonathan Haidt underscores the importance of asking the right question. It makes sense to pause and examine the kind of answer we are expecting whenever we ask for the ‘meaning’ of something. To ask “what is the meaning of life” is not asking to define life. Rather than expecting a direct answer, we are hoping for some enlightenment – or an aha experience. An insight in which things we have not understood before begin to make sense. So what we are really after is not the purpose OF work but the purpose WITHIN work. So we will not get hooked into a debate on ‘do you live to work or do you work to live?’. Instead we dive a little deeper. The below paragraphs and drawings are all inspired on the last chapter of Haidt’s magnificent 2009 best-seller – more in particular: the paragraph called ‘Love and Work’. 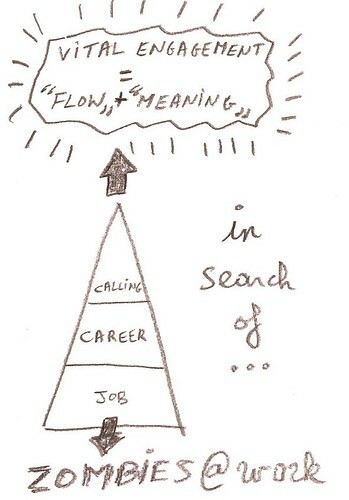 Recent research suggests that most people approach their work in one of three ways: as a job, a career or a calling. If you see your work as a job, you do it only for the money and you tend to look at the clock frequently while dreaming about the weekend ahead. 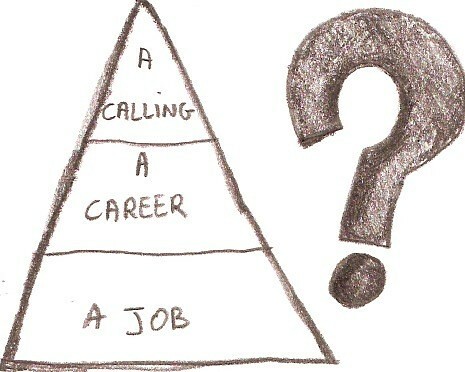 If you see your work as a career you have larger goals of advancement and promotion. The pursuit of these goals often energizes you and you sometimes take work home because you want to get the job done properly. Yet at times you wonder why you work so hard. 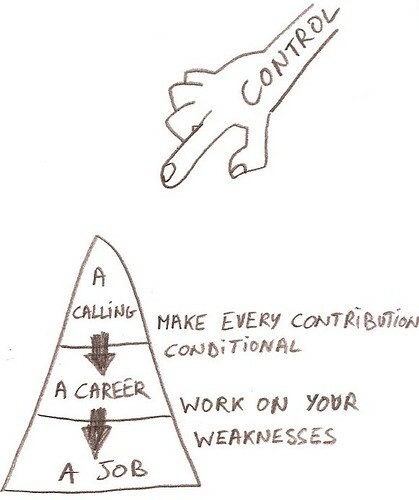 If you see your work as a calling however, you find your work intrinsically fulfilling. You see your work as contributing to a greater good. You have frequent experiences of flow during the workday and you don’t have the desire to shout ‘Thank God It’s Friday’. 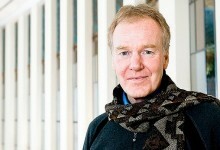 Peter Senge pointed to the mechanistic mindset of change initiatives when he said “We keep bringing in mechanics–when what we need are gardeners. We keep trying to drive change–when what we need to do is cultivate change.” The same is true for work itself and the way we look at work. When you approach employees as plants to grow instead of robots to fix, you will easily find that you can’t fix a plant like you can fix a robot. You can only give it the right conditions: water, sun and soil and then… wait. It will do the rest. Love and work are to people what water and sunshine are to plants. People have this intrinsic need to contribute beyond themselves. 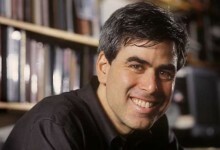 According to Jonathan Haidt, the craving for a realization of love and work can even be found in Maslow’s pyramid as Esteem – which is mostly earned through one’s work. The question we should ask ourselves is ‘what is the best way to tap into this energy so that people can find self esteem in their work? The search for purpose within life turns out to be a matter of aligning love and work in your life. Getting the right relationship between you and your work is not easy. However, if you think that blue-collar workers have jobs, managers have careers and the more respected professionals (doctors, scientists and clergy) have callings, you are wrong. In his book Haidt cites research that suggests that ‘occupational self-direction‘ is the determining factor. In earlier posts I have described this occupational self-direction as ‘job control’ and ‘job autonomy’ and came to the same conclusions. Nevertheless, I would like to quote the inspiring example he used to state this fact. In a study of hospital workers, Amy Wrzesniewski, a psychologist at Yale University, found that the employees who cleaned bedpans and mopped up vomit, sometimes saw themselves as part of a team whose goal was to heal people. They went beyond the minimum requirements of their job description, for example by trying to brighten up the rooms of very sick patients, or by anticipating the needs of the doctors and nurses. They viewed their work as a calling, and enjoyed it far more than those who saw it as a job. The conclusion coming out of this research in positive psychology is that most people can get more satisfaction from their work. 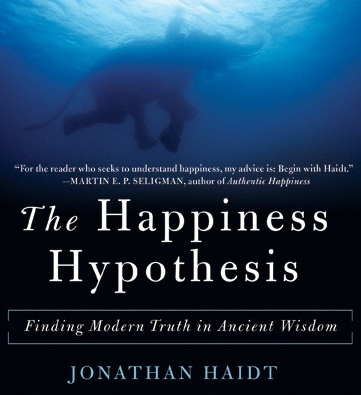 In this respect, Haidt cites the research of Mihaly Csikszentmihalyi on Vital Engagement, described as a relationship to the world that is characterized by both experiences of flow and meaning. The first step is to know your strengths. Look for the aspects in your work that make use of your strengths. Haidt advises to re-cast and re-frame your work in order to reflect your strenghts even if that would involve some extra time. Sadly, I have experienced first-hand that the opposite is also true: focus on your weaknesses and you are spiraling downwards: zombies at work. If you can find your strengths in your work you will find more gratification in work. If you find gratification you will shift in a more positive mind-set. Finally, it will be easier for you to see the bigger picture and the contributions you are making. 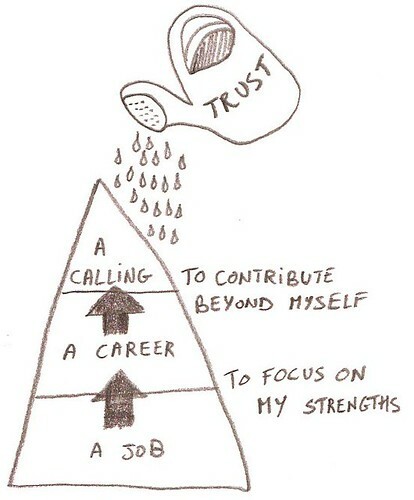 Your job might turn into a calling. The meaning of work then becomes connection, engagement and commitment. Work done with love is the meaning within life. Love and work are crucial for human happiness because they can draw us out of ourselves and into connection with people and projects beyond ourselves.